Marisabina Russo is the author and illustrator of numerous books for children, including The Line Up Book, which won an International Reading Association Children's Book Award, and Come Back, Hannah!, which was named a Charlotte Zolotow Highly Commended book. 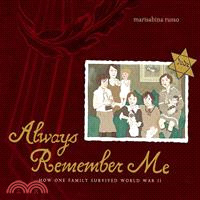 Always Remember Me is based on the survival story of her own grandmother's family during the Holocaust. Ms. Russo lives in Westchester County, New York.